Clematis montana at its best. There are three different C. montanas on the front of the house. I love it looking like this. Lovely, your house is perfect for using clematis. Wow it's huge. Mine is a tiny sprig compared to yours. How old is it? Thanks. Chris, I just don't know - our predecessors planted them, so they could be anything up to 20 - 25 years old! The bases are like trunks. Another jigsaw puzzle picture. Beautiful, Spritz. Looks wonderful, it compliments your lovely home perfectly! Spritz your house is brill, always fancied living in something like that,your clematis looks well aswell. The clematis are spectacular, but I'm a sucker for beautiful houses too, and this is surely the prettiest I've seen in a long time. Really lovely. The whole picture is one of beauty. What a lovely setting. Oh this is stunning Spritz ! What a lovely sight to greet your visiters when they come to view the garden ! Looks like a "Chocolate Box" house - full of character! What a gorgeous sight Spritz. What a lovely position for the montana as well, crawling up the house! The whole front is looking just spectacular! Thank you - are you coming down to one of the open days, Dave? You could see all of it - not just the front! Superb what a gorgeous home you have, it is beautiful. "A thing of beauty is a joy forever..." such is your home and it's cladding. Clematis montana ...wow! I wish I lived closer ...I would love to see your whole garden! Congratulations, Spritz! Thanks, Lori - I wish you did too! Ummm.... let me think...errr - No thanks! Interesting that the house is getting more comments than the clematis, lol, you guys are on the wrong site! I too think you have a lovely house ...but imagining it without the planting, it wouldn't have the same charm. I think that it's the garden (and the clematis !) that makes your house something special. Oh, Barbara....your cottage looks wonderful, the grey stone with pink Montana...stunning, and the beautiful stone wall...its truely a picture, all your visitors will love it! Maybe when the roses take over from the Clematis? What a charming looking house. How long has it taken for the clematis Montana to grow that big? Could be as long as 20 years! I love this photo, Spritz. LOL......However did you come across this photo??? i was just browsing through the photos and came across this beautiful house and garden its straight out of a picture book so old world charm. love the clematis mine grew at the side of the front door, but, my husband who doesnt really like gardening said the roots were growing under the foundations and it had to go... it was a very sad day as it was a wow factor for the neighbors, still time for a change... ellise. Thank you, Ellise. I know how lucky we are to live here. 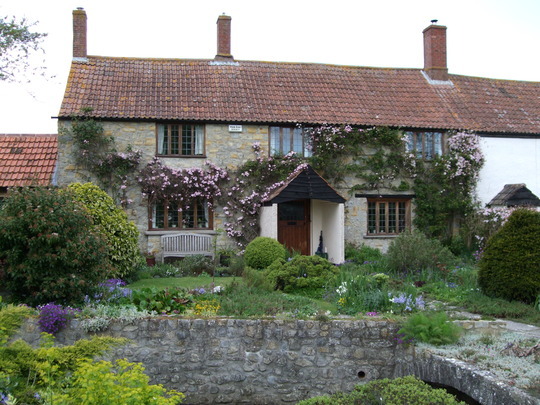 I'm sorry about your Clematis - this house is so old that it hasn't actually got any foundations - not as such, anyway - it sits on a 'raft' of stone. Charming house & lovely clematis cladding those charming old walls. I went for a drive with my OH on Sunday & I saw lots of the beautiful pink montana, clambering over walls & up trees. I haven't really noticed that before, so our misty wet spring weather must be perfect for it this year. I really must get one started somewhere in my garden. It seems strange that you're looking at C. montana flowers, Dwyllis, when we're coming into Autumn! Just picture perfect, and for a plant that cost so little doesn`t it strut its stuff.